Saturday May 30- 1931 A special from Winnie this morning. I will not go by way of Chicago as she is not well. I went up town and sent her a letter. I found Hattie here when I got back. She stayed till noon After dinner I wrote Laura & Birdie. Then rested awhile. Hattie came in a taxi at four olock and we went over to Otts to his 50th anniversary of graduation in law. There was about twenty people there a most happy event. Rob came for us about 9.30 Fannie hoped to see this. 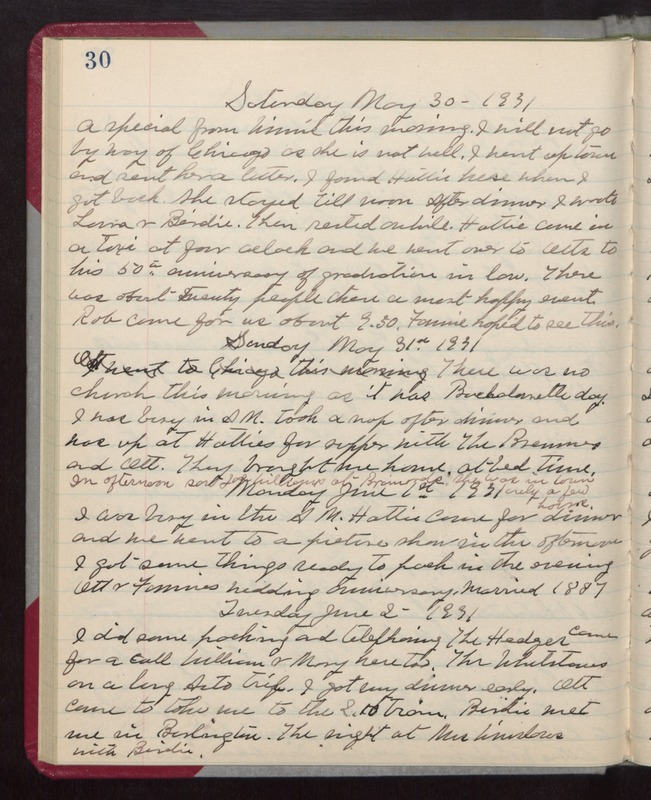 Sunday May 31st 1931 There was no church this morning as it was [Bachalaurette] day. I was busy in the AM. took a nap after dinner and was up at Hatties for supper with The Bremners and Ott. They brought me home, at bed time. In afternoon saw [Josie] Williams at [Brainards]. She was in town only a few hours. Monday, June 1st 1931 I was busy in the AM. Hattie came for dinner and we went to a picture show in the afternoon. I got some things ready to pack in the evening. Ott & Fannies wedding anniversary. Married 1887 Tuesday June 2 - 1931 I did some packing and telephoning The Hedges came for a call William & Mary here too. The Whetstones on a long Auto trip. I got my dinner early. Ott came to take me to the 2.10 train. Birdie met me in Burlington. The night at Mrs Winslows with Birdie.